Lately, I’ve really been into recycling and going green and whatnot. So, here is one of my recent recycled creations (actually I believe the new term is upcycled). 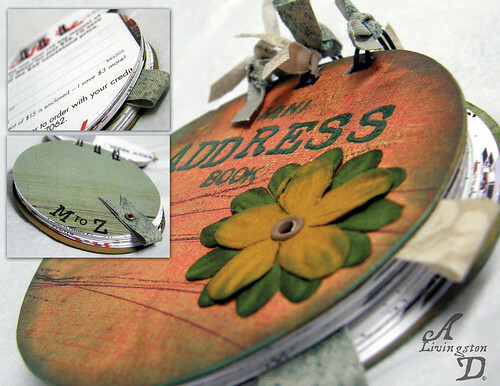 It is a mini-address book and the inserts are from those subscription inserts that come in magazines. I just started collecting them from magazines (and it added up quickly) then I cut each one into a circle. This came together rather easily so I will definitely make another one of these. Actually, if anyone out there is interested in one, I will be willing to make one for you, the catch is you must supply the inserts (since I don’t really subscribe to many magazines). Leave a comment and let me know. Aysha – this is SOOOO cute. You are so creative!!! Keep sharing your work girl! Where do I put in my order?